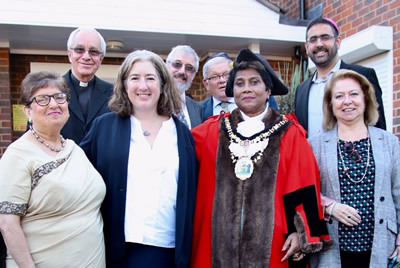 Left to right: Sonoo Malkanik Father Richard Parsons, Rabbi Naomi Goldman, Rabbi Michael Hilton, Councillor John Hinkley, Councillor Kareema Marikar (Mayor), Miqdaad Versi, Councillor Jean Lammiman. Kol Chai welcomed the Mayor of Harrow – Councillor Kareema Marikar – at their annual Interfaith Shabbat over the Mitzvah Day weekend. The congregation was packed with representatives of different faiths from across the borough and from the churches in Hatch End. The guest speaker was Miqdaad Versi, media officer of the Muslim Council of Britain, who emphasised the importance of interfaith work and stressed that “we must get to know each other and learn to trust each other”. A recent example of that has seen Kol Chai joining other faith organisations to form ‘Harrow Citizens’ – Jews, Christians, Muslims and other faiths working together for the common good. During the service, Kol Chai’s Rabbi Naomi Goldman quoted from Reform Judaism’s ‘Prayer for Interfaith Gatherings’: “In that which we share, let us see the common prayer of humanity; where we differ, let us wonder at human freedom. May our courage match our convictions and our integrity match our hope”.